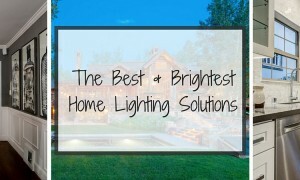 Here’s a bright idea! Find style, privacy & function with these 5 beautiful window treatments. Installing new window treatments is a quick home improvement project that immediately adds style and personality to bedrooms, living rooms, and beyond. Whether you’re excited about adding color, texture, and volume to a space, or simply rejuvenating a room by playing with the light, the 5 beautiful window treatments below provide plenty of inspiration. Want to transform your space with the touch of a button? Pair the relaxed folds of a Roman shade with motorized lift. 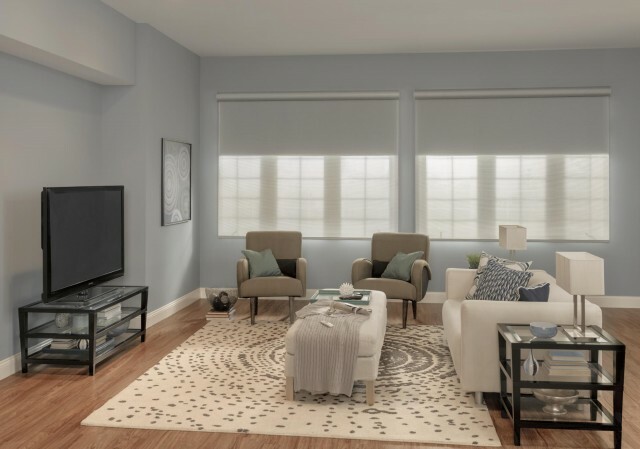 Motorization allows you to use a handheld remote control, wall switch or programmable timer to adjust out-of-the-way window coverings, lower an entire room full of shades to enjoy the last rays of the sunset, or dim the light (and reduce glare) to sharpen the picture of your favorite TV show. Above: Standard Bali Roman Natural Shades with Cordless Lift: Highpoint, Brook 35113 with 2″ Edge Banding: Taupe 1007, Room Darkening Liner, and 6″ Standard Valance. Natural shades bring a rustic look to your windows, playing off of this season’s popular rough hewn wood furniture and accents, as well as other natural fabrics. Taking elements of the landscape inside, natural shades are hand woven with bamboo, jute, grasses, and other sustainable materials, adding an earth-friendly vibe your space. Above: Dual Shades with Motorized Lift and Cassette Valance: Roller Shade (Back): Rowland, Slate 20004; Solar Shade (Front): Terrace, Sterling 40233. 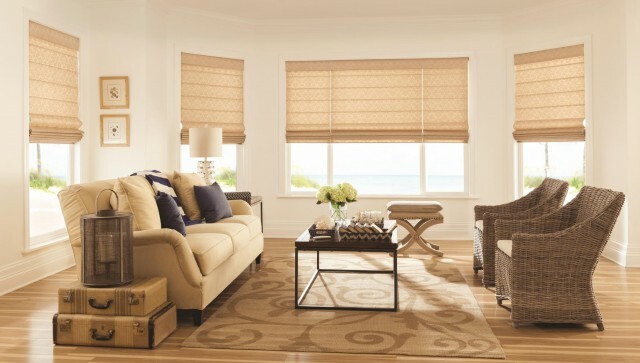 Two great shades that go even better together: Sheer solar shades protect your furnishings and rugs from harmful UV rays, while softening natural light. 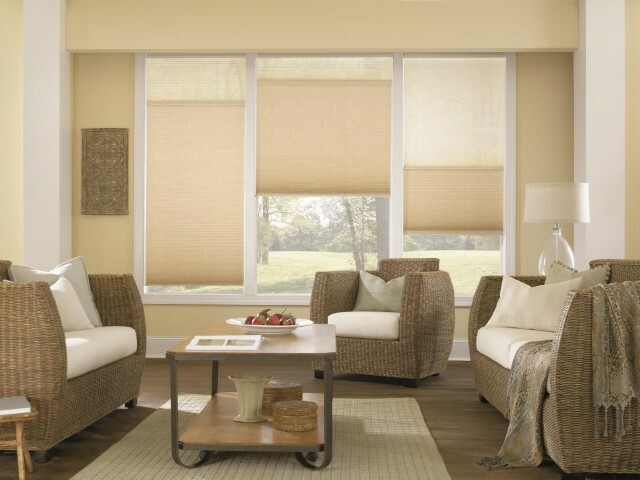 Room darkening or blackout roller shades can block out the sun like you’re flipping a switch. Put them together in a dual shade and you have ultimate flexibility: either shade can be lowered or raised to match your mood, your activities, or even the time of day. 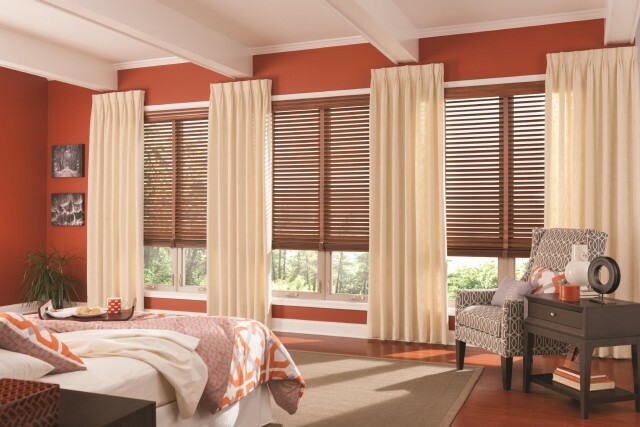 Wood blinds offer great light control—adjust the slats just so, to let in as much sunshine as you need. When lowered and tilted closed, these blinds also let you enjoy total privacy. Add drapery panels to accentuate (or create!) long lines, cool contrasts in texture, or to make wall colors pop. Full folds of fabric can both brighten and soften the space. With the Sun Up/Sun Down cellular option, it’s a snap to pair fabrics of different styles, colors, and privacy levels to create the perfect combination shade. The split makes all the difference when you mix sheer and blackout fabrics to let in light through the day and have absolute privacy when you need it. These are just a few of the possibilities. Are you ready to re-do a room? Or overhaul the whole house? 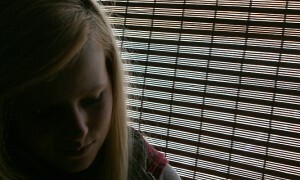 Remember, if you can dream it you can do it. And Bali can help. For more great information and galleries of pictures to add to your inspiration wall visit Bali Blinds powered by Somfy or the Bali Blinds blog. Home Tip of the Day: Never Forget Your Lunch at Home Again! 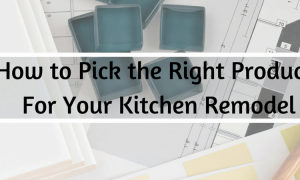 The ultimate guide to planning a kitchen remodel presented by Home Depot & Coldwell Banker Real Estate.